German carmaker Volkswagen was facing a big challenge in the fast-growing market of Russia. Big competitors like General Motors, Ford, Renault, Hyundai and BMW began producing in Russia long ago, and they have all secured a share of the market. Cars coming in from outside are charged an import duty of 25 per cent, making it hard for imports to compete. Volkswagen, in particular, had found it difficult to sell cars in Russia, with just under 30,000 cars moving out of showrooms this year. When Volkswagen expanded its manufacturing to the Moscow area with a new plant that is designed to build 115,000 vehicles per year from 2009, one of the first jobs was to asses the storage systems available so the company can house its wide range of spare parts in the most economical way, and optimise storage capacity within the space available. Working to a tight construction schedule and with no time to lose, their 2,000 square metre spare parts warehouse had to be fitted out in just six weeks. Metalsistem, the chosen contractor, delivered and installed the 300-tonne, 4-tier installation using all stock items, without having to resort to specially designed and made products. The racking reaches to 8.5 metres and gives Volkswagen a total of 12,450 square metres of storage area. Metalsistem uses a boltless system that makes the racking, shelving and bins flexible and adjustable. The products are manufactured to worldwide recognised standards for shelving and racking (FEM, TÜV, etc.). Metalsistem utilised the height given and constructed the impressive 4- tier installation using a combination of two of its standard systems, Unirack and Super 456. Both systems come with a standard range of boltless flexible accessories from sliding dividers, modular containers and other various binning systems, all available within the company’s standard range. The wide range of accessories gives VW the opportunity to maximise its storage capacity for each unique part or item, and the system being boltless has contributed to the speed of the assembly, as well providing flexibility for future growth as required. Metalsistem is one of the largest Italian manufacturers, with 11 storage systems as standard stock items. A wide range of systems is available in over 75 countries in the world, including Australia. The company was able to execute this installation within six weeks, without affecting customers in other parts of the world. Metalsistem S.p.A. was founded in 1968 thanks to the managerial verve and creative spirit of its founder, Antonello Briosi, a role that he continues to play with tenacity and imagination. The company’s first activities centred around designing and producing roll-forming machinery. The experience gathered in the production of the machinery, the numerous patents and the considerable market success of the first range of roll-form galvanised steel profiles were assisted by the company being recognised and certified by the relevant controlling bodies in Europe. One of the most fascinating transformation processes of structural steel takes place in the Metalsistem production facilities. The result of man’s tenacity and inventiveness, developed from research and the evolution of technology, the roll-forming process imparts form onto blank steel coil surfaces. Metalsistem purchases galvanised or pickled structural steel coils. Galvanisation occurs using the Sendzimir process, guaranteeing elevated resistance and durability characteristics. Metalsistem acquires the cold rolled coils in standard widths varying from 1.00 to 1.25 metres. Upon arrival in the production facilities, the coils are slit into various widths that will be used to produce the diverse catalogue of Metalsistem products by one of the most innovative and technologically advanced slitting lines available today. The slit coils entering production are transformed either by roll forming or brake pressing, depending on the product being manufactured. The roll forming process consists of passing a continuous ribbon of structural steel through a series of rollers that progressively plastically deform the material until the required shape is achieved. Generally, the process of roll forming is used to produce profiles that would otherwise require numerous folding and forming actions in order to produce the final section. The machinery that Metalsistem uses for this type of production exceed lengths of 30 meters and are the result of meticulous research and development on the part of Metalsistems own research and development division. by the brake press process. Once again, Metalsistem’s background as a machinery manufacturer has enabled brake-pressing techniques to be finetuned, allowing the production of highly functional accessories of intricate design and geometry. Metalsistem has its own dedicated research and development division that has been active for many years, providing ongoing support for the manufacturing activities. By researching options through numerical analysis and experimental research, highly innovative products resulted. The use of refined calculation methods and sophisticated experimental techniques, together with strict quality control, has enabled Metalsistem to certify the quality and safety of its products to international standards. For more information call Metalsistem Australia on (03) 9310 5939 or visit www.metalsistemaustralia.com. 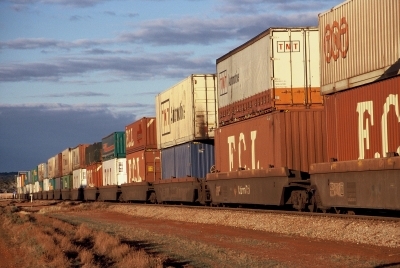 Trends in US logistics: will Australia follow?